The unit has sat in the workshop for a long time & belonged to Rick Wakeman’s keyboard tech. It is in need of a DPDT switch. 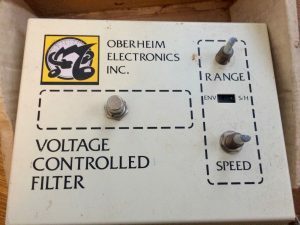 “Super rare Oberheim VCF-200 Voltage Controlled Filter pedal. This is a VCF that can be controlled by and envelope follower or Sample and Hold. This unit is in very nice condition with a few small nicks and dings in the paint, but about as nice as you’re likely to find. Everything works great, no scratchy pots, and it sounds terrific.” Auction ended. Click here to browse on eBay. MODEL VCF-200 S/N B 1832 1970’S??? SOLD AS-IS AS-PICTURED ” Auction ended. Click here to browse on eBay.